By Audrey Golden. Jul 8, 2017. 9:00 AM. Will you be traveling to Poland anytime soon? There’s no better country in Eastern Europe to seek out rare and antiquarian books, and in fact, we’re pretty well convinced that Kraków and Warsaw contain some of our favorite rare bookshops in the world. As a UNESCO City of Literature, Kraków contains nearly 80 bookstores and almost 30 shops selling used, rare, and antiquarian books. While the city of Kraków has not entirely been spared the fate of many cities once boasting dozens or more rare and antiquarian shops—bookstores in Kraków, too, have closed entirely or moved to online sales—it nonetheless retains a wide variety of options for the discerning book buyer. A majority of the rare and antiquarian stores are located in the Stare Miasto, or Old Town, which is the historic center of the city. We recommend starting your book journey on ulica Szpitalna—the street known for its wealth of used, rare, and antiquarian bookshops. Our favorite shop on this street is Antykwariat Rara Avis. 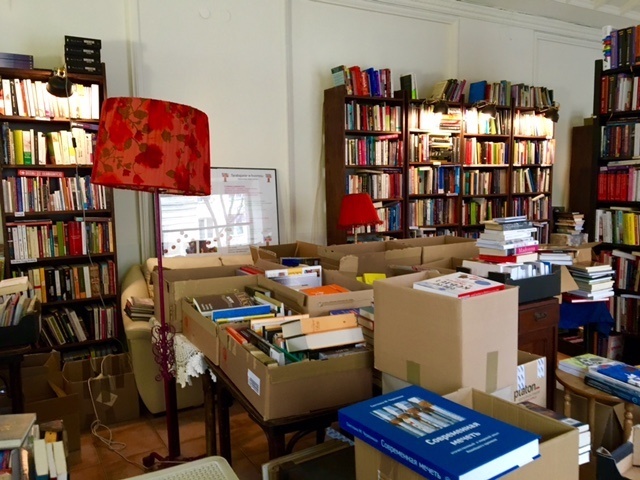 The store has an entire first floor of books and ephemera, largely from the nineteenth and twentieth centuries. We found a number of interesting translations of twentieth-century Russian poets—not surprising, given that Poland was firmly within the Soviet sphere of influence for much of the latter half of the twentieth century—as well as some incredible first editions of Polish writers. For instance, we found a first edition, first printing of Miron Białoszewski’s A Memoir of the Warsaw Uprising. And when it comes to ephemera, this shop can’t be beat. 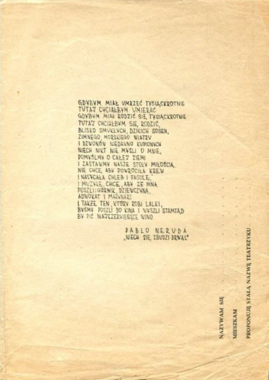 We found a 1956 playbook for the first Bim-Bom (an alternative student theatre group in Gdansk) production, featuring a Polish translation of Neruda’s “Que Despierte el Leñador” [Let the Rail Splitter Awake]. In the basement of the store, visitors can browse through hundreds of Polish cinema posters. Another notable shop on ulica Szpitalna includes Antykwariat Wójtowicz. Throughout the Old Town, on seemingly random streets, you can find rare and antiquarian bookshops just around the corner. For instance, at ulica Świentego Jana 3, you’ll find Antykwariat Stefan Kamiński. The shop is narrow on the inside, with shelves of books that reach from the floor to the ceiling. Cloaked in tungsten light, visitors can search for a wide variety of nineteenth- and twentieth-century works of literature and art, as well as historical and political texts. The shop also has a wide variety of early-twentieth-century paper ephemera, if you’re interested. At ulica Slakowska 19, also inside the old town, is Krakowski Antywariat Naukowy. Specializing largely in fiction and poetry, there are many interesting editions of Czesław Miłosz’s poetry. We came away with a stack of poetry journals, bound in brightly colored paper wraps, from the 1960s. Don’t stop your book hunting in Kraków once you’ve reached the edges of its Old Town. To be sure, there are many exciting shops located farther from the city center. For instance, the Kraków Academic Antiquarian Bookstore, located on ulica Sławkowska, has been in business since 1946. There are large sections dedicated to almost every discipline, and the store also sells maps, manuscripts, and other pieces of paper ephemera. One of our favorite shops outside the Old Town is Antykwariat Galicja, located at ulica Garbarska 5. It has been in business since 1980, and it specializes in poetry and fiction. This store has a very large number of Polish poetry journals, many hand-bound editions published in very small runs. We were thrilled to get a chance to browse through them and to come away with a few to keep. It would be hard to travel to Poland and to look for books in only one city. If you catch a high-speed train, Warsaw is less than three hours from Kraków. For reasons beyond its rare and antiquarian book culture, it’s well worth the trip. But since we’re guiding you to bookstores, we’ll start with some of the shops closest to Warsaw’s Old Town. Located at Krakowskie Przedmieście 20/22, Antykwariat Atticus is a small shop with some interesting nineteenth- and twentieth-century works inside, including a number of Polish cinema posters. At Aleje Jerozolimskie, a major thoroughfare in Warsaw and very close to the central train station, you’ll find Antykwariat Warszawski tucked inside an arcade. This shop has a number of works of fiction, as well as rare and antiquarian texts from other disciplines. If you walk from Antykwariat Atticus to Antykwariat Warszawski, you can also stop at Antykwariat Troszkiewiczów, at Wspólna 6. With shelves that literally reach to the high ceilings, you’ll need a ladder to see what’s up high. This store has a substantial amount of ephemera, particularly related to the German occupation. 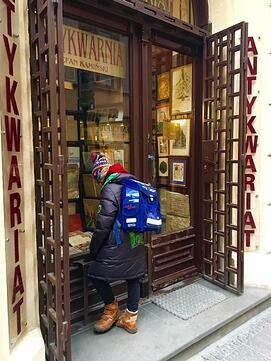 Our favorite rare and antiquarian bookstore in Warsaw, however, is Antykwariat Kwadryga at Wilcza 29A. You wouldn’t find this shop if you were strolling along the street. It’s located at the back of a courtyard behind a heavy wrought-iron gate that requires visitors to ring the bookstore owner to be let inside. Here, too, there is a lot of paper ephemera, largely from the German and Soviet occupations of the country. There are also large sections dedicated to poetry and cinema, and we came away with a compilation of Spanish-to-Polish poetry translations from 1956, and a miniature Andrzej Wajda cinema book. What’s not to love? We love Poland, and we can’t wait to return to discover more used, rare, and antiquarian bookstores in other cities across the country. We invite you to do the same.